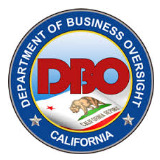 The Department of Business Oversight (DBO) was established in July 2013 as part of general reorganization of state government proposed by Governor Jerry Brown. It consolidates functions of the Department of Financial Institutions and the Department of Corporations and is housed in the Business, Consumer Services and Housing Agency. The department regulates and supervises state-licensed financial services, including banks, credit unions, premium finance companies, money transmitters and issuers of travelers checks. The Department of Business Oversight (DBO) is a relatively new agency. It was created July 1, 2013, as part of a larger reorganization of state government’s executive branch. The agency combines the functions of the Department of Financial Institutions (DFI) and the Department of Corporations (DOC) into a single entity while continuing to employ each as separate divisions. The forerunners of the DBO have long histories. While the Department of Financial Institutions was only in existence since 1997, its roots went back more than 100 years. In 1878, two decades after California began granting charters to financial institutions, the state created a three-person Board of Bank Commissioners that placed “every savings bank and banking company incorporated under the laws of this state (California), or any other state or country and doing business in this state” under its jurisdiction. The board’s powers were weak, and in 1909 California passed the Bank Act, which created the State Banking Department and a superintendent of banks, appointed by the governor. The Bank Act was revised in 1949, 1951 and extensively in 1979, before the Department of Financial Institution was created in 1997. The DFI core was the State Banking Department, which regulated commercial banks and trust companies. Jurisdiction over savings and loans, credit unions and industrial loan companies was transferred from various other agencies, including the Department of Corporations. The Department of Corporations was established in November 1913 as the State Corporation Department during the administration of Governor Hiram Johnson, a leading American progressive who championed the ballot initiative, power to recall politicians, women’s suffrage and direct election of U.S. senators. The department’s first biennial report in 1916 claimed “that actual fraud may be largely eliminated” at no harm to legitimate business and lauded its protection of consumers. The department began regulating HMOs in 1975, shortly after they entered the marketplace and long before the explosive growth in managed care. Criticism of its oversight and widespread anger at HMO practices resulted in creation of an independent HMO regulatory agency in 2000. The deregulation and subsequent collapse of the Savings & Loan industry in the 1980s had no larger stage than California. The department and its commissioner figured prominently in the scandal surrounding Lincoln Savings, the Irvine-based firm whose owner, Charles H. Keating Jr., was convicted in state court of charges stemming from his misuse of the S&L’s deposits. Keating and his business partners, taking advantage of loosened federal guidelines, began sinking assets originally meant to be used mostly for conservative home and business loans into risky, speculative ventures. Part of Keating’s misuse was a Department of Corporations-approved offering of $250 million in worthless bonds marketed to elderly investors. A lawsuit brought against Keating and parent company American Continental Corp. named the commissioner at the time of the bond-sale approval, Franklin Tom, as a defendant. Tom left the commissioner’s office and went on to represent Keating against the Department of Corporations, which under new leadership sued Keating and the company. Keating’s 1991 conviction on state charges related to the bond offer was later overturned on appeal because of a judge’s error in jury instructions. Tom and his department successor, Christine Bender, were eventually cleared in a probe of their roles in the scandal. An ongoing area of concern for the department was regulation of payday loan companies, businesses that lend small amounts of money to customers who have trouble accessing funds through conventional sources who then often fall into far greater debt because of fees and charges. In a related area of what is known as predatory lending, the department was criticized for its treatment of “flooring lender” companies Automotive Finance Corporation and Dealer Services Corporation, aka Discover DSC. The department found that the company had been operating for several years without a license in California but settled for a $60,000 fine. A recent court case involving a Fullerton used-car dealer accused of grand theft auto after being unable to continue repaying his loan to DSC under its onerous but heretofore legal terms resulted in the car dealer’s conviction–despite DSC’s unlicensed status at the time of the 2006 loan. The department was heavily involved in the cleanup of mortgage lending practices that contributed to the state's and the nation's deep economic recession beginning in 2006. The passage of Assembly Bill 260 tightened rules regarding so-called “subprime” loans, placed fiduciary responsibility on mortgage brokers and banned negative amortization loans. Assembly Bill 329 addressed predatory practices especially affecting seniors buying reverse-mortgage loans. A Center for Public Integrity study in 2009 pegged California lenders as responsible for 56% of $1.38 trillion worth of subprime mortgages from 2005-2007 nationwide. Countrywide Financial Corp. of Calabasas wrote $97.2 billion in subprime loans in the period. Following Countrywide were Ameriquest Mortgage Co. of Orange and New Century Financial Corp. of Irvine. The Department of Corporations began taking administrative and civil action against the latter two in 2006 and 2007, but the department's list of Actions & Litigation shows no activity against Countrywide, which was taken over by Bank of America in 2008. The department regulates state-licensed financial institutions, products and professionals, enforcing the state's financial services laws and providing resources for state residents to make informed financial decisions. The department’s Administration handles Business Operations and Services, Fiscal Services, Human Resources and Information Technology. The Division of Corporations (a separate department in its own right until 2013) provides licensing and consumer protection. It also regulates securities brokers and dealers, investment advisers and financial planners, consumer and commercial lenders including mortgage lenders, payday lenders, escrow companies and other fiduciaries. The Financial Services Division reviews license applications for payday lenders and those companies covered under the California Finance Lenders Law, the California Residential Mortgage Lending Act, the Check Sellers, Bill Payers and Proraters Law, and escrow law. The Securities Regulation Division is responsible for the qualification of the offer and sale of securities. It also oversees the licensing and regulation of broker-dealers, broker-dealer agents and investment advisers under the Corporate Securities Law of 1968. The Enforcement Division pursues administrative and civil actions for violations of the laws administered by the Division of Corporations. Its most common type of cases involve securities regulation enforcement—primarily the investigation of complaints of securities fraud. Its actions may include censure of licensees and suspension or revocation of licenses. It also brings civil injunctive actions to appoint receivers over companies, obtain restitution and penalties against violators, and otherwise enforce the California laws. The Division of Financial Institutions (also a separate department in its own right until 2013) oversees the operations of state-licensed financial institutions. Those include “banks, credit unions, industrial banks, savings associations, trust companies, foreign banking organizations, business and industrial development corporations, money transmitters, issuers of payment instruments and travelers checks, and premium finance companies.” The division also oversees the Local Agency Security Program, which as of 2014 included 10 approved financial institutions empowered to act as agents handling pooled securities that secure local agency deposits. The department’s Office of Legislation and Policy provides in-house legal advice to the agency and its various divisions in addition to ensuring consistent application of relevant laws. The office also serves as intergovernmental affairs liaison. The Office of Public Affairs provides information to the public, media and various stakeholders. The department takes complaints online about licensees here. The department has a 2014-15 budget of $83.8 million and employs 601 people. It does not rely on the state’s General Fund for money. A bit more than half of its funding comes from the State Corporations Fund (pdf) and about a third is generated by the Financial Institutions Fund. Less than 10% comes from the Credit Union Fund. In October 2010, with the state and nation still reeling from the housing market crash that began in 2008, state legislators called for the Department of Financial Institutions (a forerunner to the Department of Business Oversight) to compel a 60-day moratorium on foreclosures. Democratic State Assemblyman Ted Lieu said an aggressive department commissioner could halt foreclosures and cited legislation he co-sponsored in 2008 that requires lenders/mortgage servicers to contact the borrower and discuss with the homeowner various options to avoid foreclosure. The lender then has to wait 30 days or must prove its due diligence at working with the borrower before filing a notice of default. Lieu said he had evidence that mortgage company executives certified between 10,000 and 18,000 foreclosure documents a month without reviewing them. The DFI expressed concern that it did not have the authority to regulate larger banks that held national charters and were regulated by federal authorities. It did not act. Bank of America, which admitted that some employees improperly approved foreclosure documents, instituted a temporary voluntary moratorium. The continuing debate over the regulation of so-called “payday” loan businesses illustrates the push-pull of entrepreneurs vs. consumer advocates, with the Department of Business Oversight as the theoretical regulatory middle of the debate (having taken over the functions of the Department of Corporations in 2013). The Department of Corporations, through its Financial Services Division, followed the California Deferred Deposit Transaction Law to license and regulate the businesses, numbering 2,400 in California as of 2008. The lenders, after a client applies, take personal checks in return for an immediate fee of $15 per $100 loaned and promise that the lender will not cash the check until a later date to allow the client time to collect his or her next paycheck to cover the check they have written. Loans in California are limited to $300 per transaction, which gives the client $255 to work with until payday. Critics of the businesses, such as the Center for Responsible Lending, say that the problem is not the initial borrowing rate–15% for a single transaction is comparable to the average annual credit card rate (e.g. 14.74% for February 2011). The problem arises when the clients “roll over” their loans, engaging in repeat borrowing that triggers fees that in worst-case scenarios can end in an APR of nearly 400% if a loan is continually rolled over. Critics also point to the lenders' strategy of marketing their service to low-income groups, the unemployed and, before federal legislation intervened, military members. Citing Department of Corporations studies, the Center for Responsible Lending in its fact and policy report noted that most of the state's one million payday borrowers (the fact sheet figure is for 2006, for loans totaling more than $2.5 billion) are repeat borrowers who fall into the payday debt trap. For instance, 450,000 borrowers in 2006 had back-to-back spells of six or more loans, resulting in the payback of “at least $525 for an initial loan of $255.” The amount paid back rises to $1,110 for a $255 loan if the spells last for 19 transactions. Defenders of the payday lender industry and opponents of reforms say the businesses provide a valuable, even crucial service to people who otherwise have little or no access to credit. They contend that the high rates are appropriate given the risk the businesses are taking in providing money to people with poor credit histories or difficult economic circumstances. The Community Financial Services Association of America is a leading advocate of what it calls the “payday advance industry.” The association, on its web page “Myth vs. Reality of Payday Loans,” offers a point-by-point answer to industry critics. Regarding the argument that payday lenders charge exorbitantly high annual rates, the group argues that critics are citing only the most extreme examples, and that other purveyors of credit, such as credit card companies that charge high late fees for late balance payments, are much worse. The group says its businesses provide services “to the heart of America’s middle class” and do not take advantage of low-income or economically disadvantaged individuals, but instead serves a client base 94% of whom have high school diplomas and 56% of whom have attended some college or have attained a degree. A group that keeps an eye on developments in the payday lending industry and claims a neutral viewpoint is pliwatch.org. Governor Jerry Brown’s pick to head the new Department of Business Oversight was head of the Department of Corporations, one of two agencies merged to form the new entity in the broad restructuring of the executive branch in 2012. Jan Lynn Owen, has extensive experience in government and the financial industry, with strong ties to big banks that make some consumer advocates nervous. Owen received a Bachelor of Arts degree in economics from California State University, Fresno in 1975. She was chief internal auditor and credit risk officer at Vallicorp Bancorp from 1981-1991. Owen was briefly chief internal auditor at Sunrise Bancorp and chief financial officer at Gold Country National Bank between 1991 and 1992. The West Sacramento Democrat moved to the public sector in 1992 as chief consultant to the California Senate Banking Committee. In 1996, she was hired as executive director of the state Department of Insurance and stayed for seven months before being appointed deputy commissioner of the Department of Financial Institutions. She was elevated to commissioner in 1999. Owen wrote in a newsletter at the time, “There is a fine line between protecting consumers and making the process so cumbersome and risky that lenders will simply do business elsewhere.” The bill died in committee. Owen left the bankers association in 2002 and moved to Washington Mutual Bank where she was state director of government and industry affairs. She was with the bank for six years until its collapse in 2008 during the mortgage meltdown and stayed for a year as vice president of government affairs after JPMorgan Chase bought the bank. Owen left in 2009 to take a job at Apple, Inc. for a year as strategic initiatives manager. She left Apple in 2010 to start her own consulting company, The Owen Group, but a year later returned to government work as commissioner of the Department of Corporations.